Has everyone recovered from Missoni for Target, yet? If so, Jason Wu for Target will be in stores on Sunday, February 5! If you don’t know the name, then you might remember the First Lady Michelle Obama’s beautiful Inaugural Gown, which was designed by up-and-coming Jason Wu. Like many high-end designers are taking on the mass market sector, such as Missoni for Target, Versace for H&M, and Karl Lagerfeld for Macy’s, the highly anticipated designer is going main stream. Dresses vary from $19.99 to $59.99. Of the 32 photos shown of the collection on the Fashionista, the looks below are my favorites. I love the simplicity but yet each piece can be dressed up or down in several ways, or just worn solo. My absolute favorite is the clean lines of the white dress with the peek-a-boo black lining! So classic and chic! These dresses are work appropriate (for those that work in a corporate office), great for date nights (just in time for Valentine’s Day), or even Sunday morning brunch. Versatility. Love it! 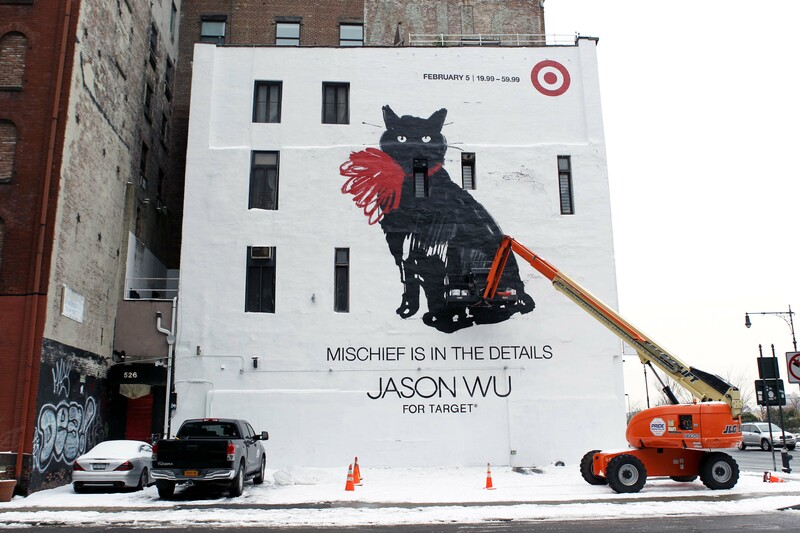 Also from Fashionista, this photo is from this past weekend that Target put up in NYC’s TriBeCa of mischievous Milu the cat that you’ll see printed on some of Jason Wu’s items. Let’s just say, I’m glad the launch date will be on a Sunday so I can 1) be up right at midnight hoping for Target’s website to have these available online (and doesn’t crash like Missoni did) or 2) be in line at the closest Target! See you on Life’s Runway!